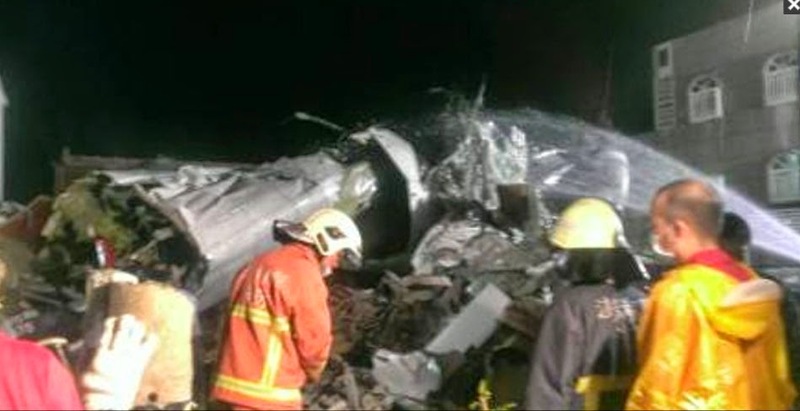 At least 45 people were killed in a plane crash in Taiwan on Wednesday, officials said, with local television reporting the flight had smashed into two houses after an aborted landing. Authorities said Taiwanese airline TransAsia Airways flight GE222, with 58 on board, crashed near Magong airport on the outlying Penghu island after having requested a second attempt to land. Television images showed firefighters working at site of the mangled wreckage and soldiers on the scene. "Fifty-one people are feared dead and seven people injured," Taiwan's Civil Aeronautics Administration Shen Chi told reporters, before the agency revised the death toll to 47. The island's local fire chief put the death toll at 45. "The control tower lost contact with the aircraft soon after they requested a go-around (second attempt to land)," Chen told reporters. The commercial domestic flight was carrying 54 passengers and four crew, officials said. It was flying from Kaohsiung and had been delayed due to bad weather, according to Shen. Typhoon Matmo pounded Taiwan with fierce winds and downpours Wednesday, leaving at least nine people injured.